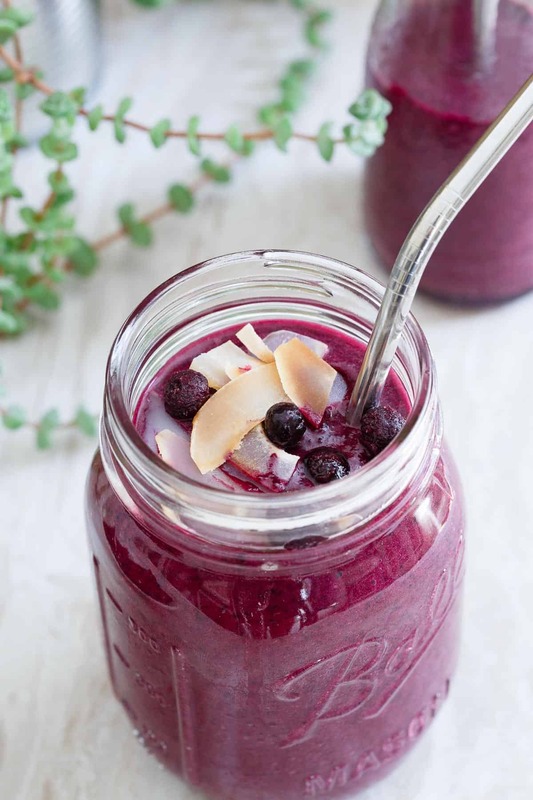 Besides the jaw dropping color, this paleo Wild Blueberry beet smoothie packs a nice boost of vitamin C as well as antioxidants. I think for the most part, people assume paleo and smoothies don’t mix. Whether it’s due to the dairy, the sweetener or even the sometimes used thickeners, smoothies don’t naturally fit into the paleo world. But I beg to differ, there’s no better way to start off a paleo smoothie than by using a wild fruit. Wild Blueberries are a special crop that has grown for over 10,000 years in one special corner of the world (Maine, Eastern Canada and Quebec). They are unchanged by man, and you can’t get more paleo than that! This post is sponsored by Wild Blueberries. All content and opinions are my own. So yes, it’s paleo but can we talk about the elephant in the room first? It’s totally natural from both the roasted beets and frozen fresh wild blueberries. If that alone doesn’t sucker you into wanting to make this dairy, gluten and grain free treat, the fact that it’s also filled with antioxidants, Vitamin C, fiber and potassium will. The first decision in the smoothie making process is to choose your base. Since we’re keeping things dairy free here and therefore eliminating milk and Greek yogurt, coconut milk seemed like a great choice. Not only is it creamy and indulgent tasting, using the light canned variety brings a healthy balance of good-for-you fats to the drink and also helps curb some of that earthiness from the beets. After the base has been decided, I like to think of the sweetener that’s going to be used. Since this smoothie has both fruit and vegetables in it and a strong flavored vegetable at that, a powerful natural sweetener is in order. Bananas are always a good choice since they have such a strong naturally sweet flavor. When trying to counteract something like a beet, they work much better than maple syrup or honey would. They’re also a great accompaniment to the intense flavor the wild blueberries bring to the smoothie. These smaller, unaltered berries pack an unrivaled intensity of sweet and tangy flavors. Next, I like to think about whether the smoothie is meant as a meal or a snack. That decision usually impacts the protein content. Since we’re not using dairy that has naturally occurring protein in it, adding protein powder or, in this case, collagen peptides (my new favorite way to add protein without altering taste or consistency) is a great idea to give the smoothie some staying power. Lastly, don’t forget the toppings! Arguably the best part of any smoothie is the sprinkling (or, if you’re doing a smoothie bowl, heaping) of toppings. 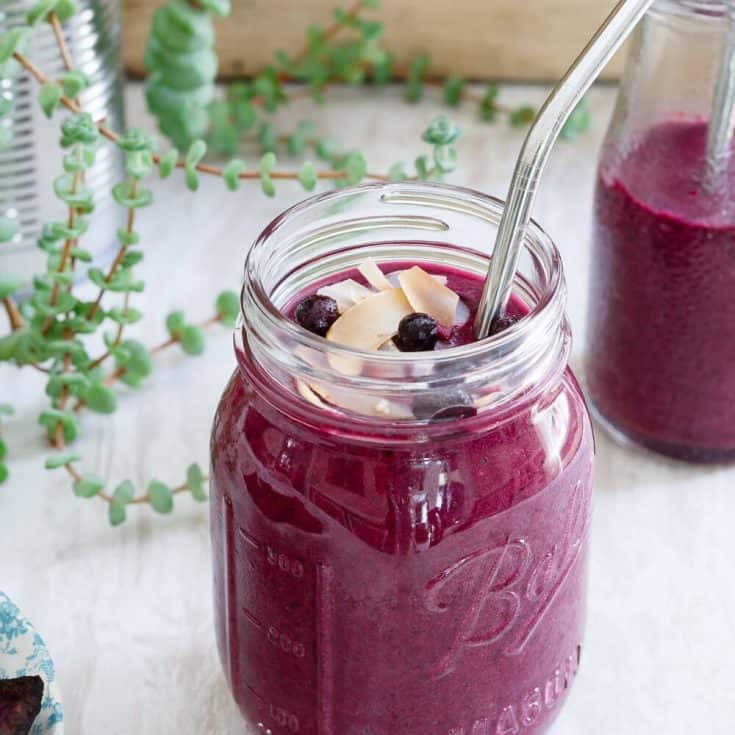 Toasted coconut flakes and a few frozen wild blueberries help highlight the flavors already in this smoothie but the world is your oyster with this step. For paleo options, think nuts, seeds, fruit or even a drizzle of drippy nut butters. Coconut butter would be fabulous on top of this one! 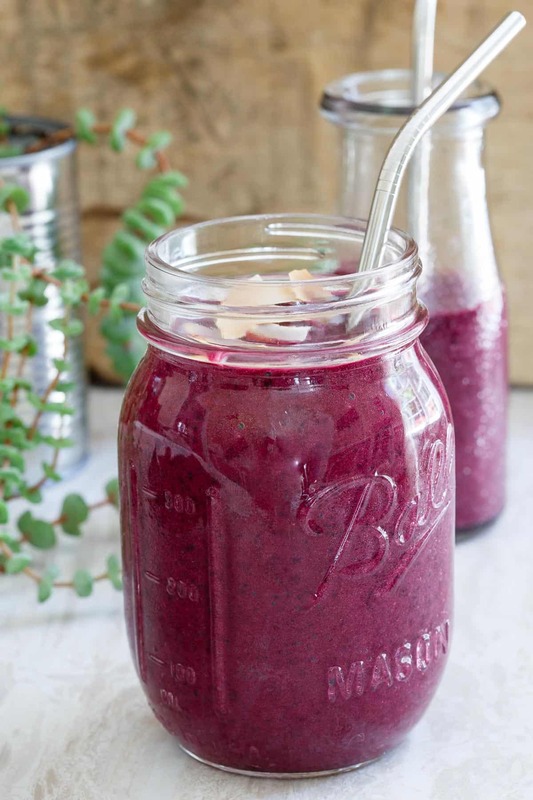 All of these things combined with the tiny yet super flavorful wild blueberries make this wild blueberry beet smoothie one heck of a start to the day! Besides the jaw dropping color, this paleo wild blueberry beet smoothie packs a healthy dose of vitamin C and a nice boost antioxidants. Check out the full recipe on the Wild Blueberry blog. Chop beets, drizzle with coconut oil and roast at 400 degrees for about 30 minutes. 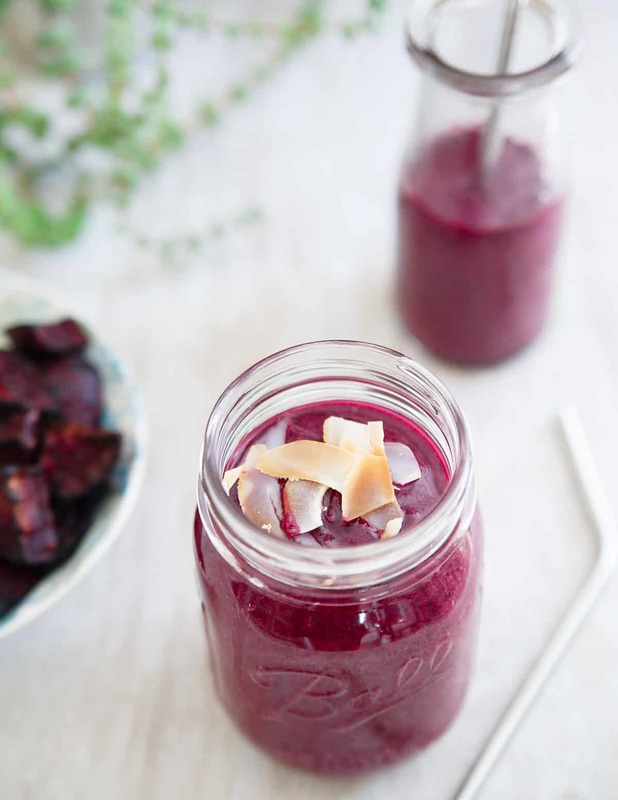 I absolutely LOVE the idea of adding the beets to this gorgeous smoothie! I make paleo smoothies all the time with collegan! LOVE beets! Totally trying this. 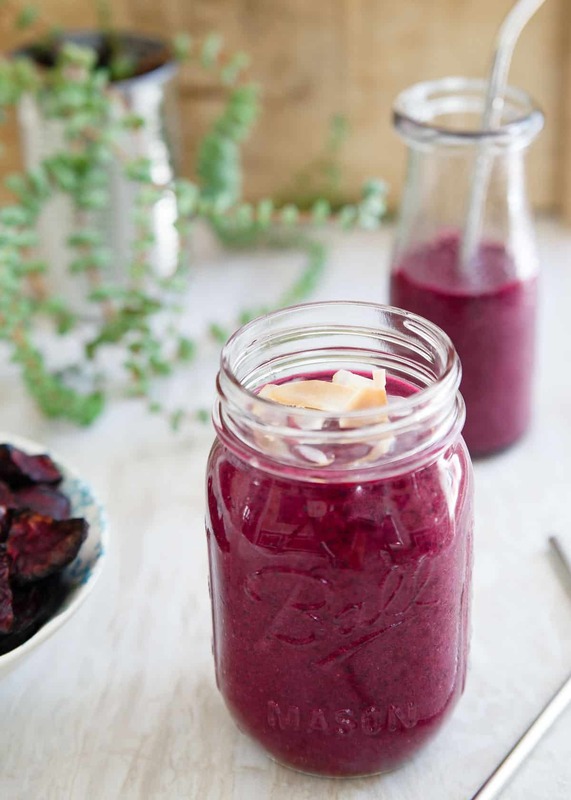 I adore beets and one enjoyed beets and blueberries in a beet berry waffle – but never thought to combine the 2 with banana in a beet blueberry smoothie! Delicious and so nutritious! This is one beautiful smoothie, Gina. We can get the wild blueberries around here in New Hampshire too, we recently picked some climbing Mt. Major near Alton Bay! Delicious. I love using wild blueberries in my smoothies, I am from western Canada and sometimes I can get fresh wild blue berries over here. They definitely tastes better then farmed. Sounds amazing and love that color! I can’t resist anything with beets – am loving them combined with wild blueberries! This smoothie looks absolutely gorgeous! That color is so stunning, and I love how it’s entirely natural from the beets and blueberries! I’m usually a strawberry kind of girl when it comes to smoothies, but I definitely want to give blueberries a try now! Yum! Paleo smoothies are kind of interesting for me. Some have whey protein, coconut oil, avocados and super low sugar substitutes for fruit and other sweeteners, but others have maple syrup and real fruit too! But you can’t really go wrong so as long as you follow the Paleo guidelines!